Born in the city of Guadalajara, Mexico, on February 19, 1887. Montenegro began studying painting under Feliz Bernardelli. In 1904, living in Mexico City, he started studying architecture, which he soon abandoned to take up studies in the Academy of San Carlos under Antonio Fabres, Julio Ruelas, Leandro Izaguirre and German Gedovius. 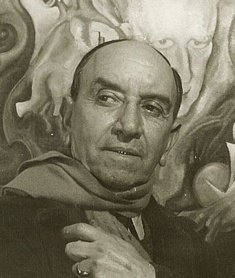 His peers in the academy included Diego Rivera, Angel Zarraga and Francisco Goitia. Later, with a scholarship from the Mexican government, he entered the Academia de San Fernando in Madrid where he met and worked with Joaquín Sorolla and Ignacio Zuloaga. In 1907 he moved to Paris where he met Picasso, Gris and Cocteau. Stimulated by the energy of Paris, he made some drawings for the magazine Le Temoin, illustrated Aladin's Lamp and wrote a biography of Russian dancer Nijinsky. The outbreak of First World War forced Montenegro to move to Mallorca, where he stayed for almost five years. During his exile he met Anglada Camarasa, a highly recognized Catalunian painter of the time, who notoriously influenced Montenegro's style. Soon after Montenegro's return to Mexico, José Vasconcelos commissioned him to paint frescoes in the convent of San Pedro and San Pablo. In 1924, Montenegro finished one of his best works "Fiesta de la Santa Cruz" on the staircase of that building. Montenegro was also an influential promoter of popular arts, organizing events such as the first popular arts festival in 1921. In the thirties he published a book "Pintura Mexicana del Periodo 1800-1860" and collaborated with Marc Chagall in the choreography of the ballet Aleko, and with Antonio Leal in the Le Simoun ballet by Lenormand. He also dedicated himself to portraiture, becoming a master of technique, best seen in a portrait of his friend Chucho Reyes Ferreira, currently found at the Regional Museum of Guadalajara. In 1951, indulging his taste for popular art, he published "Retablos Mexicanos". He successfully exhibits his work both in Mexico and in foreign countries, which yields him multiple acknowledgements. In 1965, the Palace of Fine Arts in Mexico City exhibited an anthology of his work spanning five decades. His death in Mexico City the 13th of October of 1968 was mourned by the artistic community in Mexico and abroad.